Well, I’ve officially hit the quarter-century mark of my lifetime. That’s right, I’m now 25 years old. Happy Birthday to me! For the last few years, I’ve written some kind of reflective post around my birthday. I like to look back and see how much I’ve changed, what I’ve learned and how I’m going to remember that going into my next year. I say every year is important, but this last year was especially impactful in my growth, both professionally and personally. From figuring out life on my own in my new city to navigating through the first year at my first “big girl” job (even though I hate the term “big girl job”), and everything in between, this past year was absolutely full of new opportunities, life lessons and eye-opening experiences. If you’re curious, you can check out my posts from my 23rd birthday and 24th birthday. The end of 2015 was not easy; a lot of things changed and for a while I wasn’t sure how to deal with those changes. The weeks, months and year that followed showed me how strong I truly am and that being my own person is a heck of a lot of fun. Life works in funny ways sometimes. 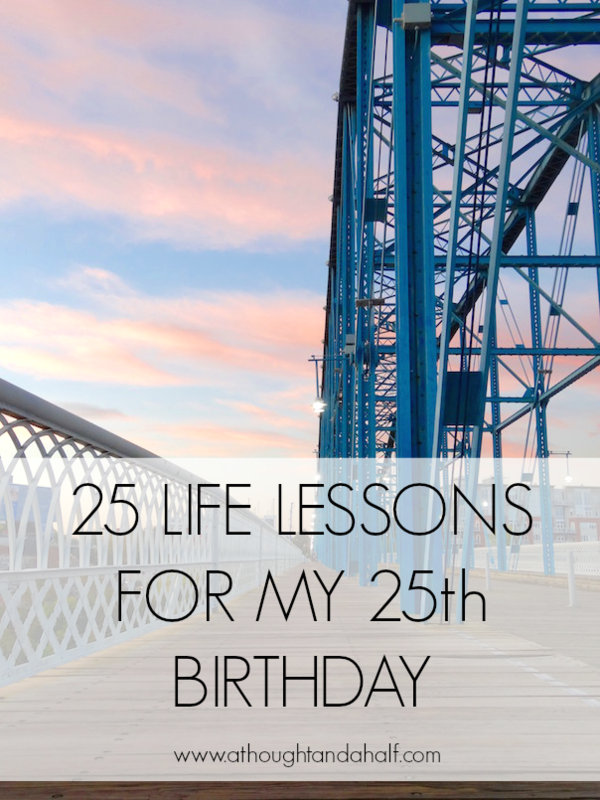 Here are 25 life lessons I’ve learned in the last year. Well, some of these I knew before this last year. But they were definitely reinforced this year. Take care of yourself first. Listen to your mind and body. Your first job out of school is hard. There’s always a learning curve. Be patient with yourself. Soccer fans are actually kind of cool. Actually, really cool. Actually, they’re the best people you’ll ever meet. And tailgating isn’t just for football. It’s not easy to put yourself out there. Taking the first step out of your comfort zone takes guts. It gets easier every time. Online dating is the worst. The absolute worst. It’s fun for a few days and then it’s the same old stuff over and over again. Related: I am not cut out for online dating. Also related: there is an art to meeting men at bars. I have not figured that “art” out yet. Never be afraid to ask for help, for anything, for any reason. Don’t let negativity get you down. If there’s negativity in your life, get some scissors and cut that sh%t out (sorry, Mom). You don’t need that. Saving money is also hard. One of my goals for this next year is to improve my budgeting habits and save a certain amount of money each month. If you have any tips, tricks or good resources, please send them my way! Brunch is the best part of the day. Or week. Being single is fun. It is also not fun. Life is full of paradoxes. Life does not end when long-term relationships end. It just means that life opened up for something better to come along. Be good at being diplomatic. That’s a skill that will come in very handy, very often. Positivity is contagious. So is negativity. People will always appreciate positivity. Don’t let the negativity take over. See #9. Be with someone who knows what he/she has when he/she has you. Be with someone who makes effort to spend time with you. Be with someone who makes you as much of a priority as you make him/her. Some people just are not good communicators. And nothing will ever change that. Nothing. Quarter-life crises are very real and you will have one. Whenever you have a chance to try something completely new, take it. You never know how much you might love it (or hate it). It’s one of the best learning experiences life has to offer. Related: music festivals are a blast. Surround yourself with people who love you, appreciate you, and value your companionship. But don’t forget to take time for yourself, to be by yourself. Everyone needs that space at some point. It’s good time to reflect and recharge and just breathe. Yoga is magical. It’s made a huge difference in my anxiety management and encourages deep breathing. Find your best methods of de-stressing and do your best to make time for that each week. Good things come to those who wait. Good things also come to those who work their a**es off and make stuff happen. Be proud of who you are and who you’ve become. Life in your 20s wasn’t meant to be easy. Everything happens for a reason. God has a plan. Let it happen how it may. Cheers to my 25th year and to the hundreds more new experiences and life lessons that lie ahead. I’m coming at this next year with wide open arms and a determination to become an even better version of myself. What are some of the biggest life lessons you’ve learned?